We regularly review and update the Code to reflect changes in regulations and principles. A comprehensively overhauled version was published in the second half of 2016. While the requirements set out in the Code generally remain the same, many changes were made to make it a more user-friendly document. The language used in the new Code is easy to understand and concise. The new layout and real-life examples give us clearer guidance in our day-to-day business. The Code is supported by detailed policies and standards that document Swiss Re’s requirements in line with applicable laws and regulations. The new Code is available to our employees in eight languages: English, French, German, Italian, Japanese, Portuguese, Slovak and Spanish. In support, we implemented our Group Anti-Bribery and Corruption (ABC) Policy in 2012. This emphasises that bribery, facilitation payments and hospitality where the giver is not present are always prohibited. For gifts, hospitality, sponsorships and charitable contributions, the policy and standards specify the correct procedures to be followed. In 2016, we integrated our ABC Policy in our Sensitive Business Risks assessment tool, which our underwriters use to screen transactions for potential negative impacts on the environment and human rights (see The Sensitive Business Risk process). This helps us to mitigate our exposure to bribery and corruption risks through appropriate due diligence on our counterparties. We also contribute thought leadership on data protection by conducting expert sessions during insurance industry events and hosting symposium events at our Centre for Global Dialogue to look at the future of regulations, cross-border data processing, big data, ethics and e-health in insurance (see Our Centre for Global Dialogue). Our Anti-money Laundering Standards set out in detail key principles and guidance in relation to our anti-money laundering and counter terrorism financing efforts, including obligations concerning “know your counterparty” and the reporting of any suspicious activities. There are several ways in which alleged violations of the Code can be reported, both by internal and external sources. For our employees, the options are described in the Code and include a whistleblowing hotline, which they can use anonymously or with identification. The hotline is operated independently by an external vendor and includes translation services into numerous languages. The specific policies regarding whistleblowing differ between our offices, based on the applicable national laws of the respective country. All new permanent and temporary employees joining Swiss Re must undergo mandatory eLearning training on the Code. Completion of the training is tracked and instances of non-completion are escalated until resolution. 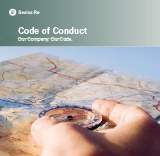 The Code eLearning course was updated in 2015, putting the focus on ethical behaviour in accordance with the principles of the Code and its relationship to Swiss Re’s values. It has an interactive character and requires employees to assess behaviour and actions in various scenarios. All permanent and temporary employees need to complete a Code of Conduct Acknowledgement every two years. The latest acknowledgement round was completed in 2015; it used a similar approach to the eLearning module, putting the focus on ethical behaviour and requiring our employees to apply the Code to a specific scenario. Third parties representing Swiss Re – such as consultants, intermediaries, distributors and independent contractors – should be carefully selected and need to comply with the Code and relevant policies. When we work with such third parties we provide them with information about the relevant requirements and, in the event of any infringements, take appropriate action, up to and including terminating a contract.